At Timberley, we offer part time places for 3 to 4 year olds. We aim to provide high quality care and education for children. If you would like your child to attend our setting, please complete an application form and return it to the school office. Attending Nursery gives your child a valuable introduction to school. It gives them the opportunity to develop their skills and mix with others of their own age. Establishing regular routines at an early age is extremely important. It will benefit both you and your children as they progress through their school life and limit the chances of poor attendance, which may have a negative effect on their enjoyment and achievement. If your child does not attend regularly they may lose their nursery place. If they cannot attend for any reason, always let staff know. You can help your child to have a positive time at school by making sure they attend regularly and on time. 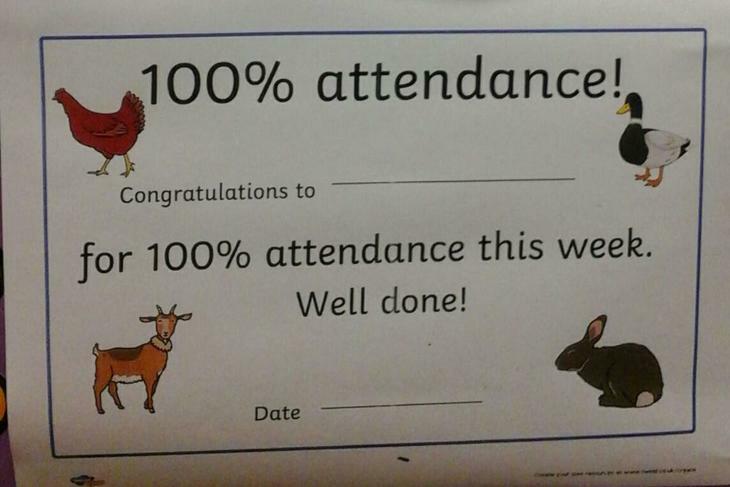 Help your child to receive a certificate each week by bringing them to Nursery every day. How many certificates can your child collect? To encourage children to begin to enjoy books and to foster a love of reading, we have a variety of story sacks for children to choose from and take home to enjoy with parents/carers. Each story sack contains a story book with a CD, a soft toy, a puzzle, a game and an ideas sheet. Your child can choose a story sack on Thursdays and return to Nursery on Tuesdays. The children really enjoy choosing story sacks and are able to talk about which stories they have read. Please let a member of the Nursery staff know if any pieces of the game/puzzle get lost or broken or if the book has be torn in any way.